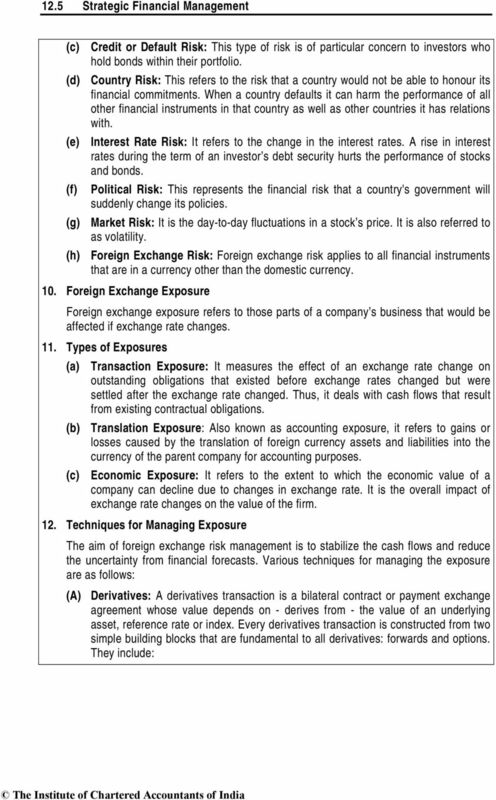 Download "Foreign Exchange Exposure and Risk Management"
1 CHAPTER 12 Foreign Exchange Exposure and Risk Management BASIC CONCEPTS AND FORMULAE 1. Foreign Exchange Market The foreign exchange market is the market in which individuals, firms and banks buy and sell foreign currencies or foreign exchange. The purpose of the foreign exchange market is to permit transfers of purchasing power denominated in one currency to another i.e. to trade one currency for another. Like any other market buyer and seller exist in this market and the demand and supply functions play a big role in determination of exchange rate of the currency. 2. Exchange Rate Determination An exchange rate is, simply, the price of one nation s currency in terms of another currency, often termed as the reference currency. The foreign exchange market includes both the spot and forward exchange rates. (a) The Spot Market: A spot rate occurs when buyers and sellers of currencies agree for immediate delivery of the currency. (b) The Forward Market: A forward exchange rate occurs when buyers and sellers of currencies agree to deliver the currency at some future date. The forward exchange rate is set and agreed by the parties and remains fixed for the contract period regardless of the fluctuations in the spot exchange rates in future. 3. 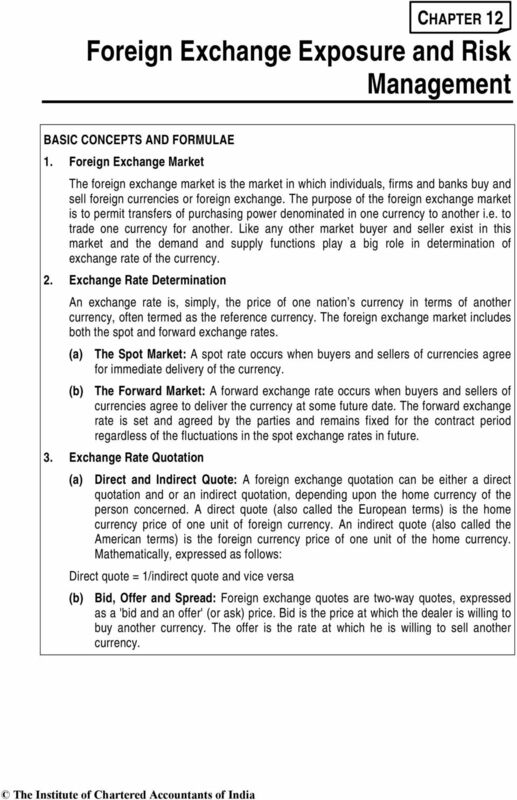 Exchange Rate Quotation (a) Direct and Indirect Quote: A foreign exchange quotation can be either a direct quotation and or an indirect quotation, depending upon the home currency of the person concerned. A direct quote (also called the European terms) is the home currency price of one unit of foreign currency. An indirect quote (also called the American terms) is the foreign currency price of one unit of the home currency. Mathematically, expressed as follows: Direct quote = 1/indirect quote and vice versa (b) Bid, Offer and Spread: Foreign exchange quotes are two-way quotes, expressed as a 'bid and an offer' (or ask) price. Bid is the price at which the dealer is willing to buy another currency. The offer is the rate at which he is willing to sell another currency. 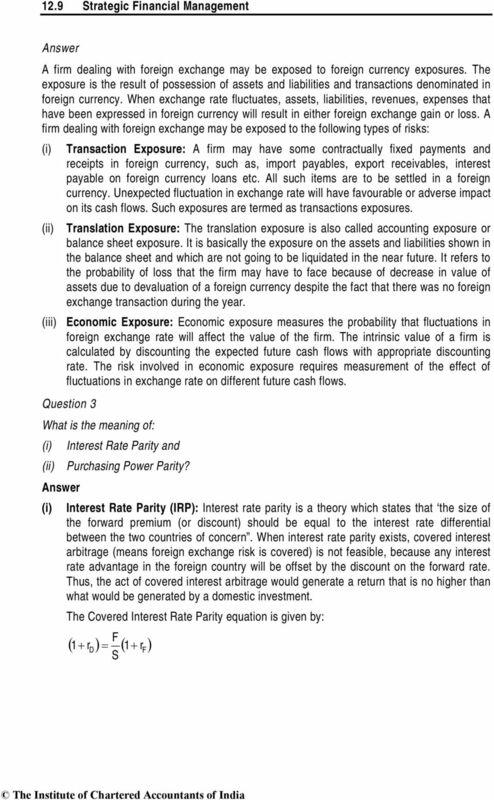 4 Foreign Exchange Exposure and Risk Management Comparison of PPP, IRP AND IFE Theories Theory Key Variables Summary Interest Rate Parity (IRP) Forward rate premium (or discount) Interest rate differential The forward rate of one currency will contain a premium (or discount) that is determined by the differential in interest rates between the two countries. 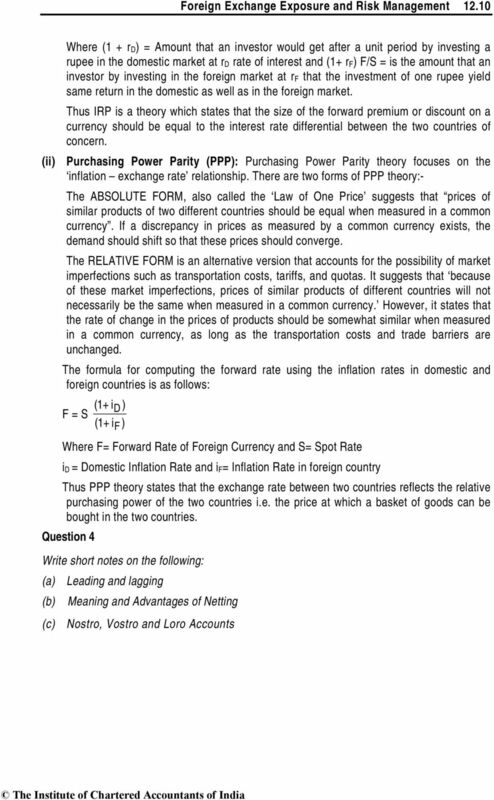 Purchasing Power Parity (PPP) Percentage change in spot exchange rate Inflation rate differential The spot rate of one currency with respect to another will change in reaction to the differential in inflation rates between two countries. International Fisher Effect (IFE) Percentage change in spot exchange rate Interest rate differential The spot rate of one currency with respect to another will change in accordance with the differential in interest rates between the two countries. 8. Risk Management A risk is anything that can lead to results that deviate from the requirements. Risk Management is, any activity which identifies risks, and takes action to remove or control negative results (deviations from the requirements). Unpredictable changes in interest rates, yield curve structures, exchange rates, and commodity prices, exacerbated by the explosion in international expansion, have made the financial environment riskier today than it ever was in the past. For this reason, boards of directors, shareholders, and executive and tactical management need to be seriously concerned that corporate risk management activities be adequately assessed, prioritized, driven by strategy, controlled, and reported. 9. Risk Considerations There are several types of risk that an investor should consider and pay careful attention to. 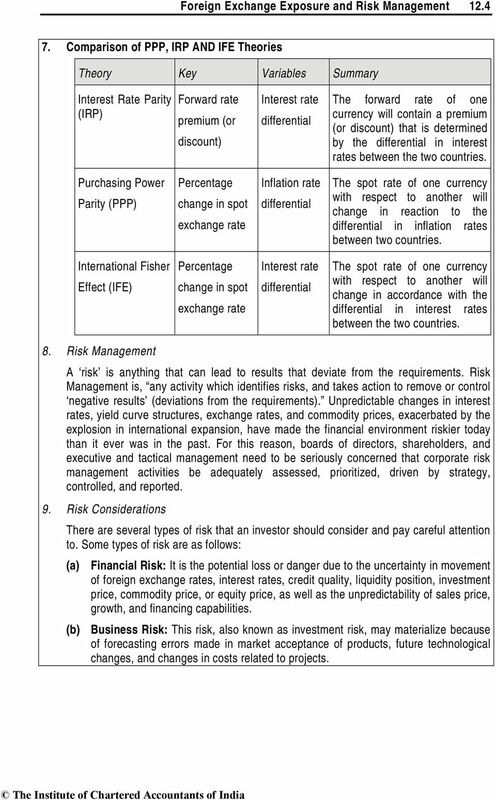 Some types of risk are as follows: (a) Financial Risk: It is the potential loss or danger due to the uncertainty in movement of foreign exchange rates, interest rates, credit quality, liquidity position, investment price, commodity price, or equity price, as well as the unpredictability of sales price, growth, and financing capabilities. (b) Business Risk: This risk, also known as investment risk, may materialize because of forecasting errors made in market acceptance of products, future technological changes, and changes in costs related to projects. 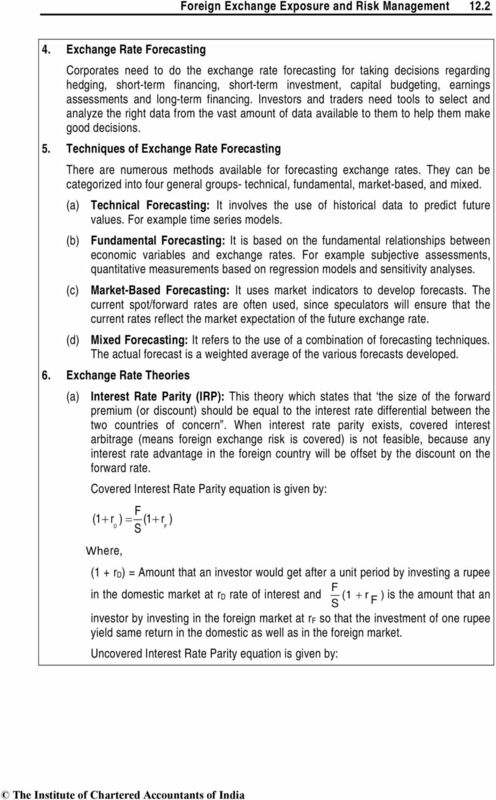 6 Foreign Exchange Exposure and Risk Management 12.6 (a) Forwards-based Derivatives: There are three divisions of forwards-based derivatives: (i) The Forward Contract-The simplest form of derivatives is the forward contract. It obliges one party to buy, and the other to sell, a specified quantity of a nominated underlying financial instrument at a specific price, on a specified date in the future. (ii) Swaps-Swaps are infinitely flexible. They are a method of exchanging the underlying economic basis of a debt or asset without affecting the underlying principal obligation on the debt or asset. 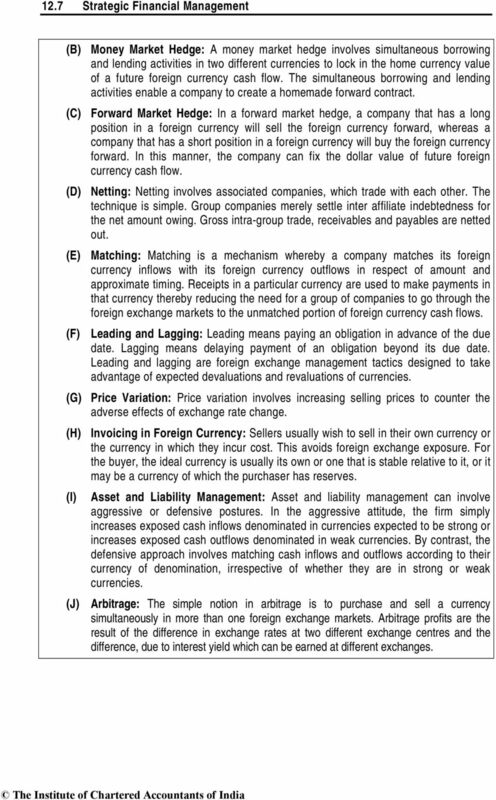 Swaps can be classified into the following groups: Interest rate; Currency; Commodity; and Equity. (iii) Futures Contracts- A basic futures contract is very similar to the forward contract in its obligation and payoff profile. 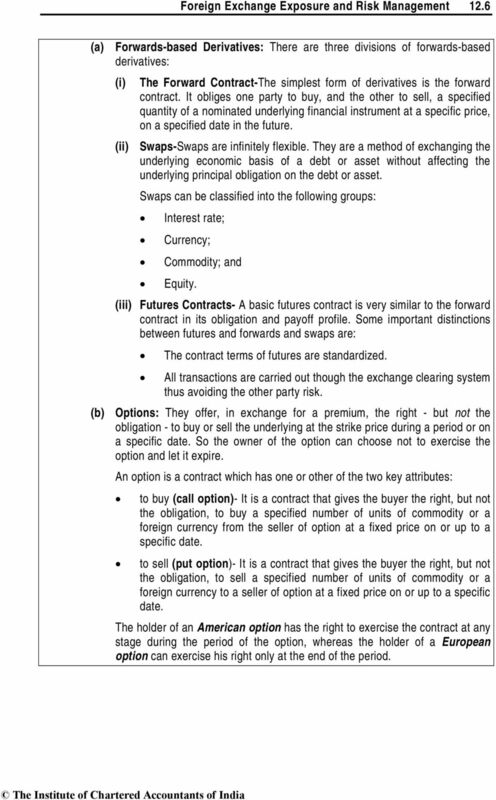 Some important distinctions between futures and forwards and swaps are: The contract terms of futures are standardized. All transactions are carried out though the exchange clearing system thus avoiding the other party risk. (b) Options: They offer, in exchange for a premium, the right - but not the obligation - to buy or sell the underlying at the strike price during a period or on a specific date. So the owner of the option can choose not to exercise the option and let it expire. An option is a contract which has one or other of the two key attributes: to buy (call option)- It is a contract that gives the buyer the right, but not the obligation, to buy a specified number of units of commodity or a foreign currency from the seller of option at a fixed price on or up to a specific date. to sell (put option)- It is a contract that gives the buyer the right, but not the obligation, to sell a specified number of units of commodity or a foreign currency to a seller of option at a fixed price on or up to a specific date. The holder of an American option has the right to exercise the contract at any stage during the period of the option, whereas the holder of a European option can exercise his right only at the end of the period. 7 12.7 Strategic Financial Management (B) Money Market Hedge: A money market hedge involves simultaneous borrowing and lending activities in two different currencies to lock in the home currency value of a future foreign currency cash flow. The simultaneous borrowing and lending activities enable a company to create a homemade forward contract. (C) Forward Market Hedge: In a forward market hedge, a company that has a long position in a foreign currency will sell the foreign currency forward, whereas a company that has a short position in a foreign currency will buy the foreign currency forward. In this manner, the company can fix the dollar value of future foreign currency cash flow. (D) Netting: Netting involves associated companies, which trade with each other. The technique is simple. Group companies merely settle inter affiliate indebtedness for the net amount owing. Gross intra-group trade, receivables and payables are netted out. (E) Matching: Matching is a mechanism whereby a company matches its foreign currency inflows with its foreign currency outflows in respect of amount and approximate timing. Receipts in a particular currency are used to make payments in that currency thereby reducing the need for a group of companies to go through the foreign exchange markets to the unmatched portion of foreign currency cash flows. (F) Leading and Lagging: Leading means paying an obligation in advance of the due date. Lagging means delaying payment of an obligation beyond its due date. Leading and lagging are foreign exchange management tactics designed to take advantage of expected devaluations and revaluations of currencies. (G) Price Variation: Price variation involves increasing selling prices to counter the adverse effects of exchange rate change. (H) Invoicing in Foreign Currency: Sellers usually wish to sell in their own currency or the currency in which they incur cost. This avoids foreign exchange exposure. For the buyer, the ideal currency is usually its own or one that is stable relative to it, or it may be a currency of which the purchaser has reserves. (I) Asset and Liability Management: Asset and liability management can involve aggressive or defensive postures. In the aggressive attitude, the firm simply increases exposed cash inflows denominated in currencies expected to be strong or increases exposed cash outflows denominated in weak currencies. By contrast, the defensive approach involves matching cash inflows and outflows according to their currency of denomination, irrespective of whether they are in strong or weak currencies. (J) Arbitrage: The simple notion in arbitrage is to purchase and sell a currency simultaneously in more than one foreign exchange markets. Arbitrage profits are the result of the difference in exchange rates at two different exchange centres and the difference, due to interest yield which can be earned at different exchanges. 8 Foreign Exchange Exposure and Risk Management Strategies for Exposure Management Four separate strategy options are feasible for exposure management. They are: (a) Low Risk: Low Reward- This option involves automatic hedging of exposures in the forward market as soon as they arise, irrespective of the attractiveness or otherwise of the forward rate. (b) Low Risk: Reasonable Reward- This strategy requires selective hedging of exposures whenever forward rates are attractive but keeping exposures open whenever they are not. (c) High Risk: Low Reward- Perhaps the worst strategy is to leave all exposures unhedged. (d) High Risk: High Reward- This strategy involves active trading in the currency market through continuous cancellations and re-bookings of forward contracts. With exchange controls relaxed in India in recent times, a few of the larger companies are adopting this strategy. Question 1 Outland Steel has a small but profitable export business. Contracts involve substantial delays in payment, but since the company has had a policy of always invoicing in dollars, it is fully protected against changes in exchange rates. More recently the sales force has become unhappy with this, since the company is losing valuable orders to Japanese and German firms that are quoting in customers own currency. How will you, as Finance Manager, deal with the situation? As a Finance Manager to deal with the situation two problems emerge (i) the problem of negotiating individual contracts and (ii) managing the company s foreign exchange exposure. The sales force can be allowed to quote in customer s own currency and hedge for currency risk by obtaining the forward contracts etc. The finance manager can decide whether the company ought to insure. There are two ways of protecting against exchange loss. Firstly, by selling the foreign currency forward and secondly, to borrow foreign currency against its receivables, sell the foreign currency spot and invest the proceeds in the foreign currency say dollars. Interest rate parity theory tells us that in free market the difference between selling forward and selling spot should be exactly equal to difference between the interest on the money one has to pay overseas and the interest one earns from dollars. 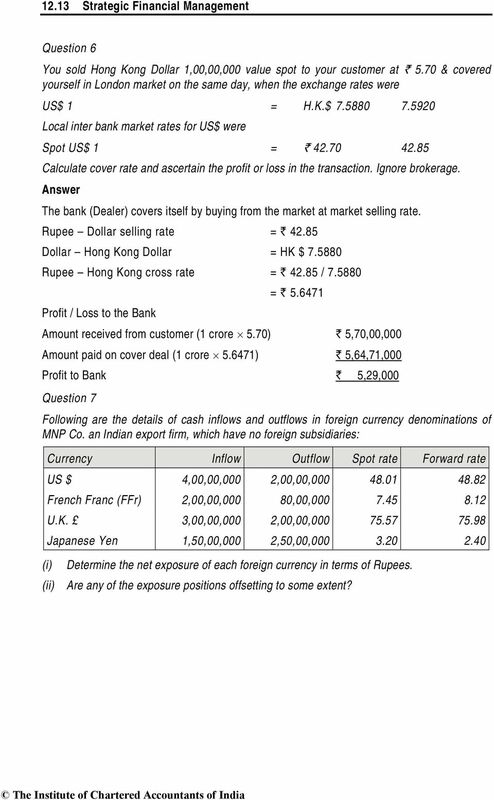 Question 2 Operations in foreign exchange market are exposed to a number of risks. Discuss. 13 12.13 Strategic Financial Management Question 6 You sold Hong Kong Dollar 1,00,00,000 value spot to your customer at ` 5.70 & covered yourself in London market on the same day, when the exchange rates were US$ 1 = H.K.$ Local inter bank market rates for US$ were Spot US$ 1 = ` Calculate cover rate and ascertain the profit or loss in the transaction. Ignore brokerage. The bank (Dealer) covers itself by buying from the market at market selling rate. Rupee Dollar selling rate = ` Dollar Hong Kong Dollar = HK $ Rupee Hong Kong cross rate = ` / = ` Profit / Loss to the Bank Amount received from customer (1 crore 5.70) ` 5,70,00,000 Amount paid on cover deal (1 crore ) ` 5,64,71,000 Profit to Bank ` 5,29,000 Question 7 Following are the details of cash inflows and outflows in foreign currency denominations of MNP Co. an Indian export firm, which have no foreign subsidiaries: Currency Inflow Outflow Spot rate Forward rate US $ 4,00,00,000 2,00,00, French Franc (FFr) 2,00,00,000 80,00, U.K. 3,00,00,000 2,00,00, Japanese Yen 1,50,00,000 2,50,00, (i) (ii) Determine the net exposure of each foreign currency in terms of Rupees. Are any of the exposure positions offsetting to some extent? 15 12.15 Strategic Financial Management Proceeds if we can encash by forward rate : $ ` ,43,000 It is better to encash the proceeds after 2 months and get opportunity gain. 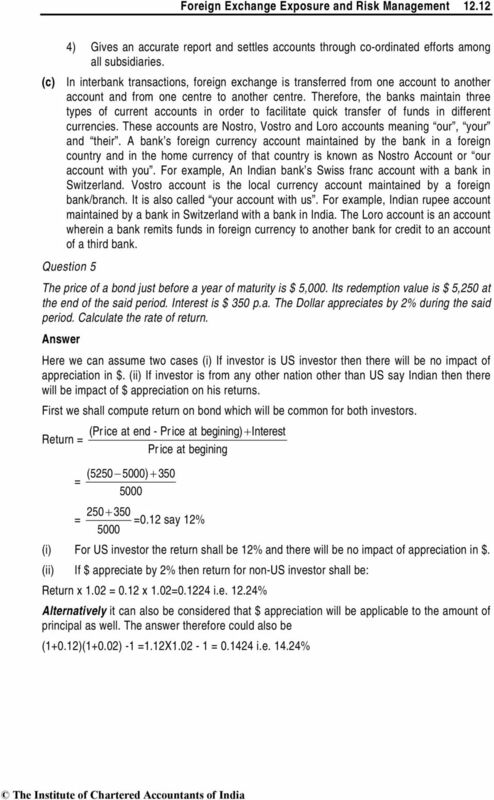 Question 9 Z Ltd. importing goods worth USD 2 million, requires 90 days to make the payment. The overseas supplier has offered a 60 days interest free credit period and for additional credit for 30 days an interest of 8% per annum. The bankers of Z Ltd offer a 30 days loan at 10% per annum and their quote for foreign exchange is as follows: ` Spot 1 USD days forward for 1 USD days forward for 1 USD You are required to evaluate the following options: (I) Pay the supplier in 60 days, or (II) Avail the supplier's offer of 90 days credit. 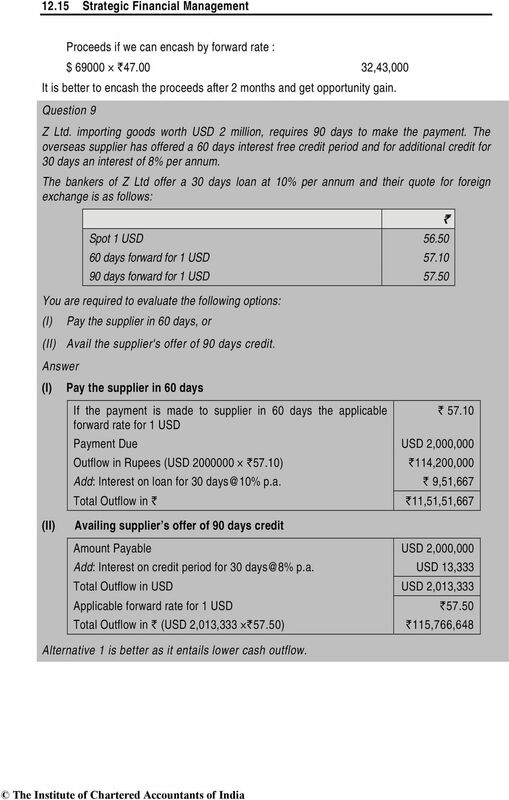 (I) Pay the supplier in 60 days If the payment is made to supplier in 60 days the applicable ` forward rate for 1 USD Payment Due USD 2,000,000 Outflow in Rupees (USD `57.10) `114,200,000 Add: Interest on loan for 30 p.a. ` 9,51,667 Total Outflow in ` `11,51,51,667 (II) Availing supplier s offer of 90 days credit Amount Payable USD 2,000,000 Add: Interest on credit period for 30 p.a. USD 13,333 Total Outflow in USD USD 2,013,333 Applicable forward rate for 1 USD `57.50 Total Outflow in ` (USD 2,013,333 `57.50) `115,766,648 Alternative 1 is better as it entails lower cash outflow. 20 Foreign Exchange Exposure and Risk Management Calculate: (i) Rate of discount quoted by the Bank (ii) The probable loss of operating profit if the forward sale is agreed to. (i) Rate of discount quoted by the bank ( ) = = 5.33% (ii) Probable loss of operating profit: ( ) 1,00,000 = ` 30,000 Question 16 Airlines Company entered into an agreement with Airbus for buying latest plans for a total value of F.F. (French Francs) 1,000 Million payable after 6 months. The current spot exchange rate is INR (Indian Rupees) 6.60/FF. The Airlines Company cannot predict the exchange rate in the future. Can the Airlines Company hedge its Foreign Exchange risk? Explain by examples. Airlines Company can hedge its foreign exchange risk by the following ways: (i) Hedging through Forward Contract: The Company can take full forward cover against foreign exchange exposure and entirely hedge its risk. It can contract with a bank to buy French franc forward at an agreed exchange rate e.g. suppose the 6 months forward rate is INR 6.77/FF. The liability is fixed and the airlines can concentrate on operation. 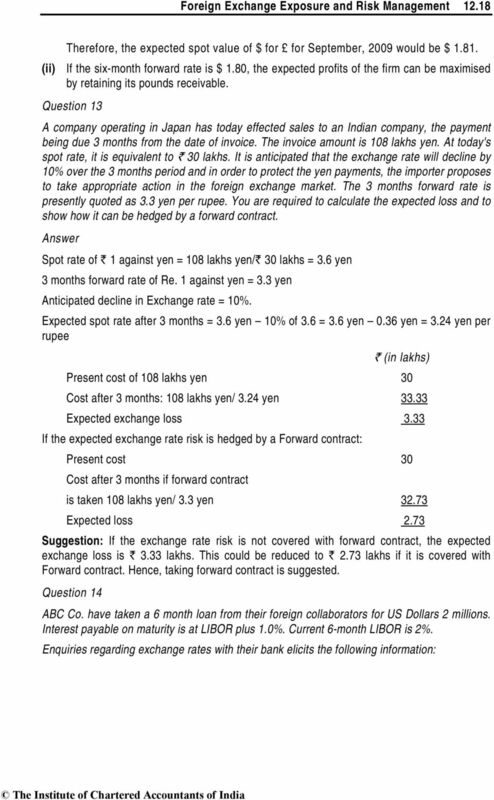 Cost of forward contract = days (ii) Foreign Currency Option: Foreign currency option is the right (not an obligation) to buy or sell a currency at an agreed exchange rate (exercise price) on or before an agreed maturity period. The right to buy is called a call option and right to sell is put option. Suppose, the airlines wants to purchase a 6 months put option. 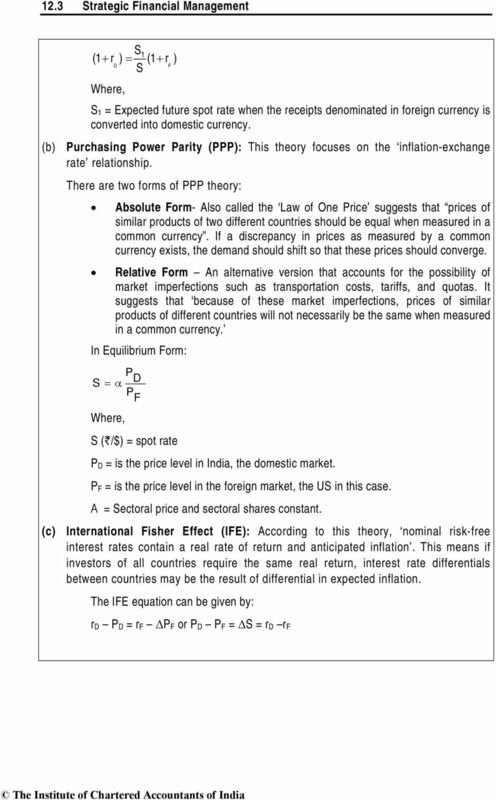 The put option exercise rate (say) is INR The Airlines will be required to pay a premium for purchasing the option say 5% of the value of put option INR = INR 335 Maximum final cost = = INR 7035 Suppose at the end of 6 months the exchange rate stay at INR 6.8/FF Airlines will exercise its put option hence it will sell (pay) INR 6.7 The exercise price to obtain one French Franc in this market, it will be required to pay INR 6.80. 23 12.23 Strategic Financial Management Alternatively if the market comes back together before December 15, the dealer could unwind his position (by simultaneously buying 62,500 forward and selling a futures contract. Both for delivery on December 15) and earn the same profit of $ Question 19 An Indian importer has to settle an import bill for $ 1,30,000. 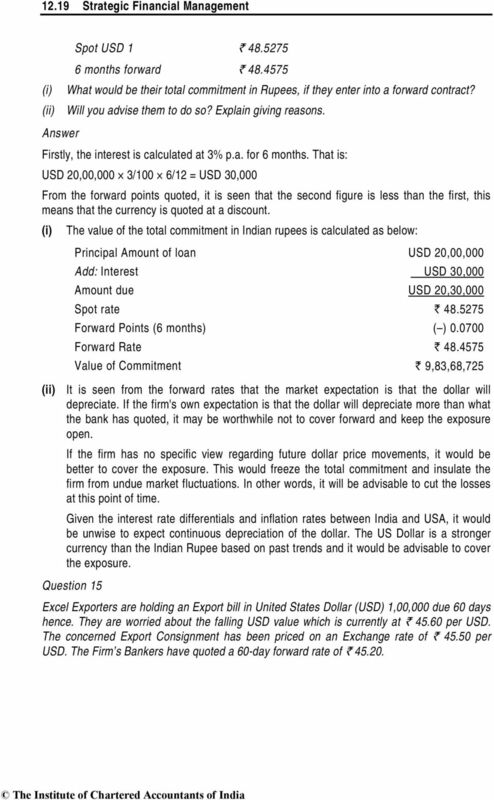 The exporter has given the Indian exporter two options: (i) Pay immediately without any interest charges. (ii) Pay after three months with interest at 5 percent per annum. The importer's bank charges 15 percent per annum on overdrafts. The exchange rates in the market are as follows: Spot rate (` /$) : / Months forward rate (`/$) : /48.83 The importer seeks your advice. Give your advice. If importer pays now, he will have to buy US$ in Spot Market by availing overdraft facility. Accordingly, the outflow under this option will be ` Amount required to purchase $130000[$130000X`48.36] Add: Overdraft Interest for 3 p.a If importer makes payment after 3 months then, he will have to pay interest for 3 5% p.a. for 3 month along with the sum of import bill. Accordingly, he will have to buy $ in forward market. The outflow under this option will be as follows: $ Amount of Bill Add: Interest for 3 p.a Amount to be paid in Indian Rupee after 3 month under the forward purchase contract ` (US$ X ` 48.83) Since outflow of cash is least in (ii) option, it should be opted for. 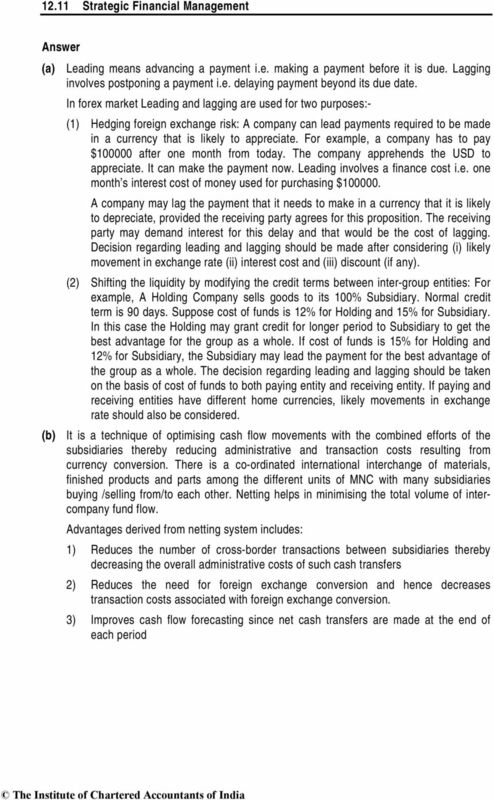 Question 20 A company is considering hedging its foreign exchange risk. It has made a purchase on 1st. January, 2008 for which it has to make a payment of US $ 50,000 on September 30, 2008. 25 12.25 Strategic Financial Management Foreign exchange rate information: Yen/` US$/` Euro/` Spot market months forward months spot Advice AKC Ltd. by calculating average contribution to sales ratio whether it should hedge it s foreign currency risk or not. If foreign exchange risk is hedged Total (`) Sum due Yen 78,00,000 US$1,02,300 Euro 95,920 Unit input price Yen 650 US$10.23 Euro11.99 Unit sold Variable cost per unit `225/ Variable cost `27,00,000 `39,50,000 `40,80,000 `1,07,30,000 Three months forward rate for selling Rupee value of `32,13,844 `47,36,111 `53,88,764 `1,33,38,719 receipts Contribution `5,13,844 `7,86,111 `13,08,764 `26,08,719 Average contribution 19.56% to sale ratio If risk is not hedged Rupee value of `31,72,021 `47,44,898 `53,58,659 `1,32,75,578 receipt Total contribution `25,45,578 Average contribution 19.17% to sale ratio AKC Ltd. Is advised to hedge its foreign currency exchange risk. Question 22 XYZ Ltd. is an export oriented business house based in Mumbai. The Company invoices in customers currency. Its receipt of US $ 1,00,000 is due on September 1, 2009.